Those things I listed are items to check in the air box. Many air boxes have two chambers separated by a plate or wall with a hole or slot in it. The compartment with the intake bell mouths is often a Helmholz resonance chamber and it resonates at a desired frequency to accentuate the intake harmonics. The other chamber holds the filter. It may be that one or more chamber resonant harmonics are wrong for your application. Put some hard boiled eggs or tennis balls in the box. This will change the harmonic resonance. See if the problem goes away. Like Peter says, a picture will help. I think I remember how those boxes look, but that is many years ago. Bo...........we have removed the inner plate from the F2-F3 box that sealed against the top of the air-filter and had an somewhat 'oval'-shaped intake. It really shrouded the #1 & #4 intakes and was sized for the stock 31mm 'pinched' carbs. Our modified box is just a shell with a screen between the halves. I am working on a design that would basically invert the upper-half of the box below the frame rails.........then set a separate box on top of the frame with intake ducts leading from the steering neck, an internal filter, and down-tubes connected stabilized air to the lower box. It would work a lot easier if I used a Special Construction frame............but I want to see it happen in the Modified class. Methinks that plate with the hole in it is for Helmholz resonance. 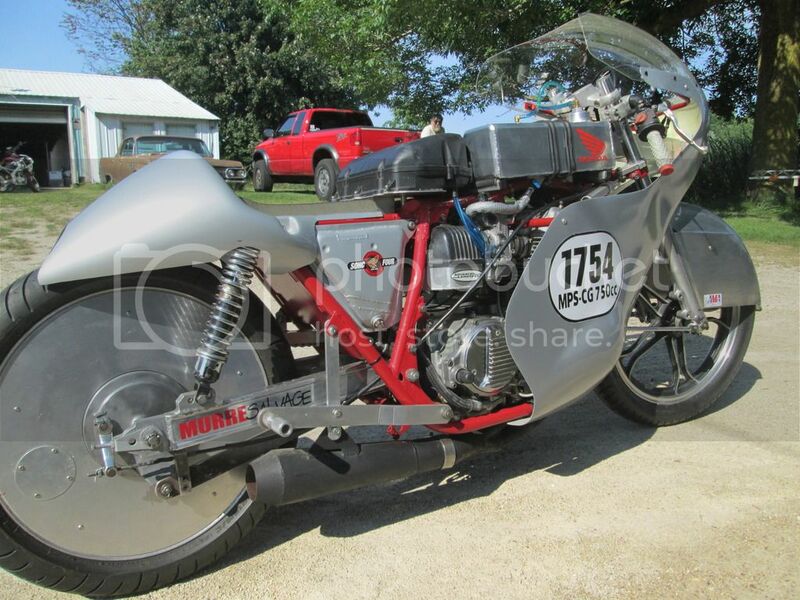 Resonance works to push or pull air/fuel mixture into the combustion chamber through the valves. It also can make the carbs see Goofus if big pressure oscillations occur over the needle jet. The venturi vacuum that pulls the fuel or emulsion out of the bowls is altered. Sometimes it happens with air boxes that the resonant frequencies inside the box and inlet tract confuse the carb metering. That might have happened when the plate was removed. Plenum volumes can be calculated by PipeMax or other formulae. That will give a good idea of where to start when designing the box volumes. The Honda plate was designed to hold the shape of the air-filter that was designed in 1967-68 and used on 28mm carbs. The intake area was cluttered with two cross-members that held centering-guides for the through-bolts that held the lower part of the box to the upper. On a modern box, a similar 'restricter' plate is noted with shorter intake-stacks on #1 & #4 to allow more air-space for balanced air availability to each carb-body............the box remained the same as the bikes transitioned from vacuum-carbs to fuel-injection. On our build we feel that most of the Helmholz (if not all) is negated by the hoped-for positive air-pressure feeding the box. We have attempted to negate closed-valve harmonics from reaching the carb venturies by extensively porting the 'roof' area of the head. I can see that more than 1 or 2 visits to the dyno will be made before we set the final design. BTW.......we will attempt to use two or more high-speed thrust-fans (furnace fans.......not leaf-blowers) to feed ducted-air to the box when in the dyno-room. The fans have reostat-controls for needed CFM to simulate cylinder-fill requirements at high-rpm. Funny you mentioned leaf blowers. I was thinking of bolting one onto the front of my bike (without the fairing) to pressurize my airbox as sort of a joke. Two throttle cables and and with the carb vents and gas tank vent connected to the airbox, the gas should still flow. I would still be in the 650cc class if the leaf blower was under 50cc, but I guess I'd no longer be considered pushrod! Now I have another year to think about it. As of now, my opinion is a sizable box needs to be slightly pressurized with sufficient intake capacity to maintain the amount of air the engine requires as it is drawn through filtered intakes to a second chamber feeding the carbs. The very slight amount of positive air-pressure is significant when measured against the LOSS of air-pressure when traveling at speed. 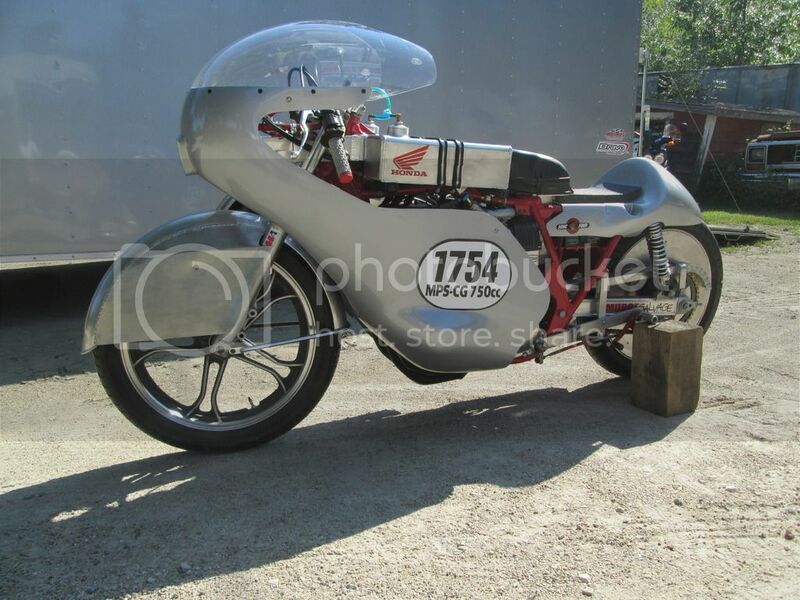 I was invited to display my Land-Speed bikes at a 'Gather on the Green' event at a resort in Elkhart Lake during the Road America VSCDA and Fall Festival event on Saturday, September 19. I talked with numerous racing fans and competitors and was pleasantly surprised at their knowledge of the poor conditions and mining issues affecting Bonneville. Dennis, look in the Nov/Dec issue of Classic Racer. There is an article about Rex Wolfenden and T-Rex Racing Developments. They do a lot of work on early CB750's for the classic bike racers in Australia. The pictures show some parts that might help you like lightened cranks that are reworked to reduce windage. APE in the US will supply lightened and balanced cranks for the sohc CB750 motors. OR, Dave Murre, my builder and tuner, may want to shave a few ounces from each weight for my planned larger displacement motor. A few days to go before we leave for the 2016 BMST and the bikes are tuned and ready to go The Classic Bonneville Racer has a few additions including a ram-air system. The Triumph Cub looks the same as before but we think we have solved its performance problem........although it holds two records. In top gear the motor was just purring along as if on a Sunday drive. I was about to take it for a spin on a dyno, but we checked the timing and found it was about 5-degrees less advanced than we thought it was set at. So all is adjusted and it runs stronger and revs higher........but starts harder (my leg) and now marks its spot because the primary case did not seal as well as it had been. Looks good, Dennis. Make sure to yell us how it goes. Bike looks bitchin Old Scrambler! Wish you good luck and look forward seeing you at the Bonneville AMA speed trials. Dennis, I will not be at the salt this year. It looks like a couple of cams need to be designed and ground for the Triumph before it does any racing. Progress is being made.